A former Vanguard Group employee sued the largest U.S. mutual fund company, accusing it of operating an illegal tax shelter for around 40 years by providing services at prices designed to avoid federal and state income tax. The complaint was filed under the False Claims Act, a whistleblower law in New York State. The lawsuit was filed in New York last year by a then-Vanguard Group Inc. tax attorney, and unsealed Friday in state court in Manhattan. The suit alleges that the mutual fund company has wrongly avoided paying taxes since its inception in the 1970s. The suit was filed by David Danon of Wayne before he was terminated by Vanguard in 2013. 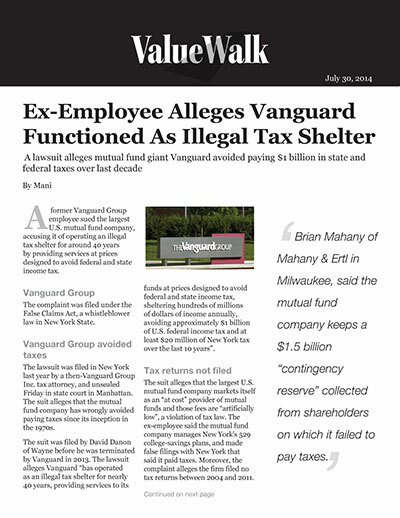 The lawsuit alleges Vanguard “has operated as an illegal tax shelter for nearly 40 years, providing services to its funds at prices designed to avoid federal and state income tax, sheltering hundreds of millions of dollars of income annually, avoiding approximately $1 billion of U.S. federal income tax and at least $20 million of New York tax over the last 10 years”. The suit alleges that the largest U.S. mutual fund company markets itself as an “at cost” provider of mutual funds and those fees are “artificially low”, a violation of tax law. The ex-employee said the mutual fund company manages New York’s 529 college-savings plans, and made false filings with New York that said it paid taxes. Moreover, the complaint alleges the firm filed no tax returns between 2004 and 2011. However, Vanguard spokesman David Hoffman claimed the case is without merit. He said in a statement: “Vanguard adheres to the highest ethical standards in every aspect of our business. It’s also important to note that Vanguard operates under a unique mutual structure and has a long history of serving the best interests of its shareholders”. David Danon’s lawyer, Brian Mahany of Mahany & Ertl in Milwaukee, said the mutual fund company keeps a $1.5 billion “contingency reserve” collected from shareholders on which it failed to pay taxes. According to a Reuters report, retail investors in the U.S. increasingly prefer to put money to Vanguard Group, thanks to the group’s investor-friendly and low-cost investing strategy.